There have been many people going by “Blockbuster” in super-hero comics. 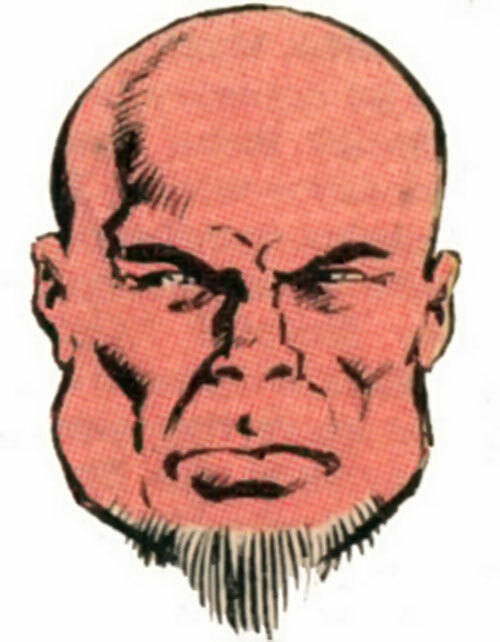 This one appeared in 1986 in the Marvel Universe. 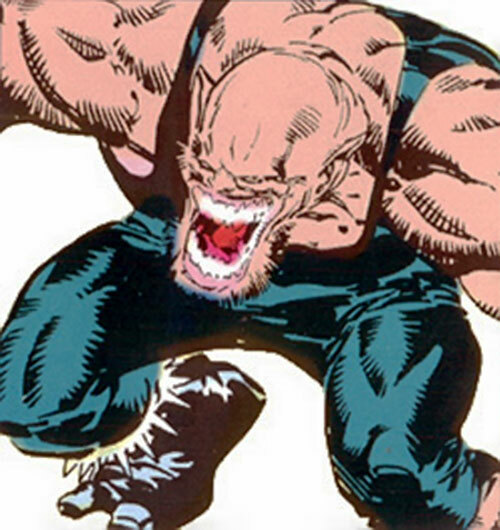 He is the brick of the Marauders, a team of mutant killers that primarily clashed with the X-Men. Height: 6’6″ (but appears to be about 7’5”). Weight: 420 lbs. Blockbuster is superhumanly strong and can lift many, many tons. Being the team’s strongman he’s often sent against any powerhouses in the opponents’ ranks. 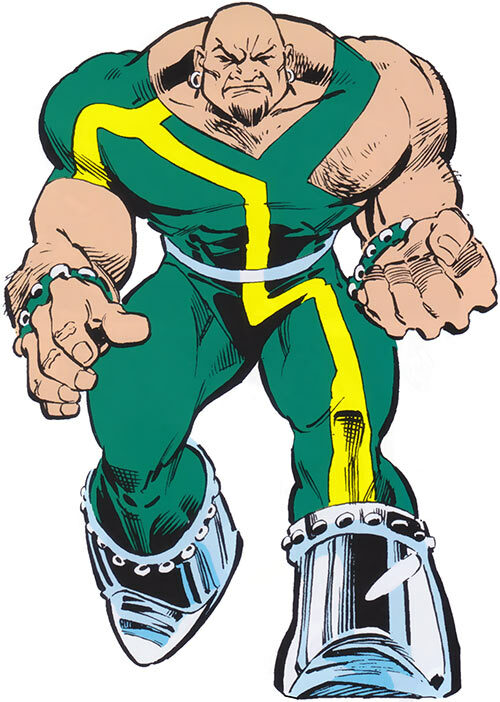 His strength is so great that he actually broke one of Thor’s arm with a single blow. However, it is important to note that at that point Thor had a brittle bone curse placed upon him by Hela. The only thing that really goes for him is his raw strength and physical toughness – although, uncannily, he also is quite adept at sneaking up on an opponent. His most often used tactic is ramming right into the opponent in an attempt to crush him completely. Michael Baer used to work with the German terrorist group known only as the Fist of Victory. At some later point he was recruited by Sinister to join the Marauders. 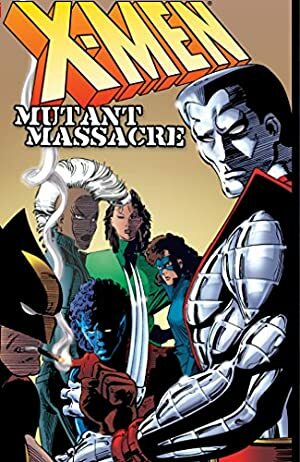 He participated in the event known as The Mutant Massacre. During the massacre, in which the Marauders invaded the Morlock tunnels, as the term implies many were killed. At one point Blockbuster, Vertigo and Harpoon hunting mutants in the tunnels came upon the Angel and Artie, whom he was saving. The Angel stayed to buy Artie some time to escape and that nearly cost him his life. The three Marauders pinned him up on a wall and were just about to kill him when Thor, the thunder god, arrived to the rescue. Thor eventually defeated the three and they had to escape. Blockbuster being mocked by his teammates for this failure decided to take down the thunder god by himself. Baer went back hunting for him. He found and surprised Thor, breaking his arm in a savage attack. Thor was stunned and Blockbuster was moving in for the killing blow. However, this was intercepted by the Angel who threw himself at him with his last effort. This gave Thor a chance to recuperate. Just when Blockbuster was about to kill the Angel, Thor struck him in his face, apparently crushing his skull, with the hammer Mjolnir. The Angel’s wings were so severely damaged that they had to be amputated. Sometime later, after a suicide attempt, he got new metallic wings from Apocalypse to become the Archangel, but has since regained his original set of wings. Blockbuster clearly died in that fight. But has since, like other dead Marauders, returned due to Sinister’s cloning tricks. Blockbuster did show up later during Inferno where he was transformed by demons into a monster and then killed by Havok. He’s bound to show up again. Blockbuster is a terribly big behemoth ! He looks like if he consisted of the muscle mass of several men. He wears really thick, big boots of metal. The top edge of the boots consists out of a band of spikes as does the arm bands that he wears. The uniform, that is blue-green-yellow in color, resembles a workout suit. The entire head and arms are kept bare showing his huge muscles. Blockbuster is bald with a beard going from ear to ear below the chin. Sometimes he just wears a goatee. In his ears he has a pair of ring formed earrings. In combat he often displays a big grin showing all his teeth while giving some snide remark. Lastly he also wears a belt of metal. Block walks with a very hulking style. The last picture is how he appeared when he was mutated by the demonic forces unleashed on New York at Inferno, shortly before he was killed by the demonically-influenced X-Men. Blockbuster is a very rough and not too intelligent man. He appears to work for different groups in exchange for money and the chance to prove himself in the eyes of the other members of the group. He always felt like an outcast even within the Marauders and his efforts to prove himself actually ended with his demise against Thor, the thunder god. He is a man of few words, but boasts a lot, often exaggerating, in combat. Of course, he also has the power to back up his words with pure physical force. Groups that deal in large scale destruction appeal to him as he may then cut loose. Future groups would probably also be involved in similar destructive themes. Blockbuster is a follower and follows most orders ; he may also go on single missions to destroy something. He is very much a sadist and enjoys the screams of pain from his victims ; “That’s music to my ears !”, like he uses to say. He is, however, not very brave. In the rare cases when he realizes he is overpowered he will run, but only to return later on in order to prove himself the most powerful one. If taunted he won’t answer, but try to prove the opposite in actions instead. Blockbuster is another really, really strong thug. Like his first DC Universe namesake he can be used in any situation in need of a mercenary thug, but this one always likes to kill his foes. Blockbuster first died against Thor, but the nice thing with the Marauders is that they can return even after their apparent demise as Sinister readily clones new ones. Marauders that again are ready for new tasks. Density Increase is Always On and is already calculated into stats. Sinister (Low), Marauders (Low), The Fist of Victory (High). Catastrophic Rage and Strange Appearance. This monster form was later killed by the X-man Havok. Helper(s): DraxarMor, Sébastien Andrivet, Roy Cowan, Nick Yankovec and more.